Subscription Fees: Subscription fees are a one-off payment for each season, these are due by October 15th. Please refer to the table above for the appropriate subscription fees for the different age groups. 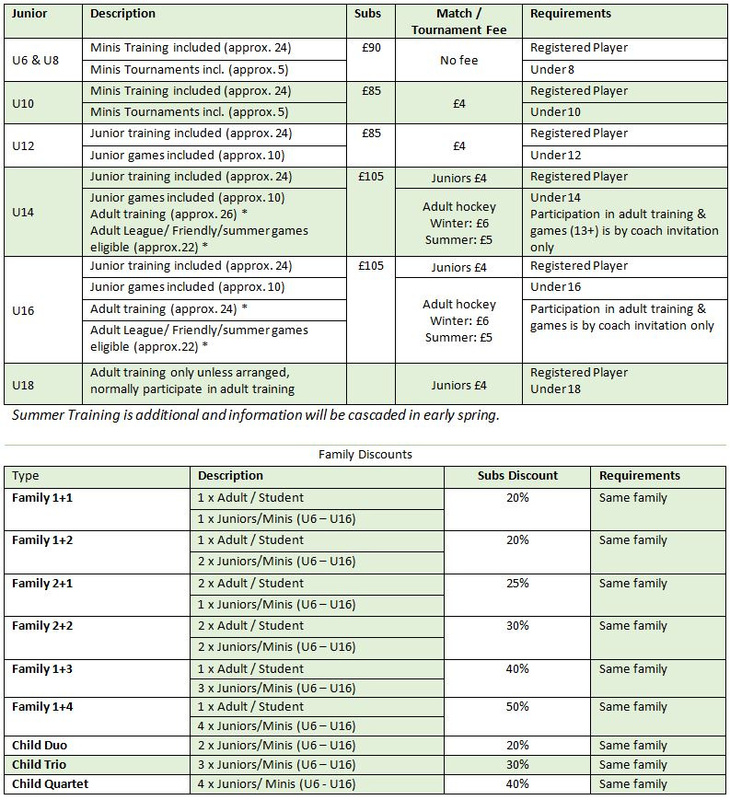 If you have more than one family member at SBHC you may be entitled to discounted subscription fees - please see the 2nd table below for details. Members joining after 1st January will be required to pay 66% of the subscription fee and members cancelling before January 1st will be refunded 33% of subscription fee. Match Fees: We are continuing to charge match fees of £4 per match/tournament for Junior players who play in U10s upwards (only U6 & U8 are exempt). This is to cover pitch costs, supply of kit, entry fees to competitions and other running costs. Details of how these will be collected this season are still being finalised and you will be notified in due course. Adult matches: Please note if your child plays in the adult matches, additional match fees will apply, please see the Adult Fees page on the website for information on the adult fees and how to pay. Late payment fees: Please note the club will apply a £10 late admin fee for all late payments to help cover the incurred administration costs. SBHC operate a strict no pay, no play/train policy which will be enforced this season. If you are paying multiple fees on one payment please advise administrator@southberkshirehockeyclub.org.uk so payment can be allocated correctly. Reduced fees: These are available (without discrimination) to persons who can reasonably demonstrate that they are unable to afford the subscription and match fees. Any request will be dealt with confidentially, and any member accepted will enjoy identical voting rights and privileges as with our standard categories of membership. Please contact secretary@southberkshirehockeyclub.org.uk if you wish to discuss.